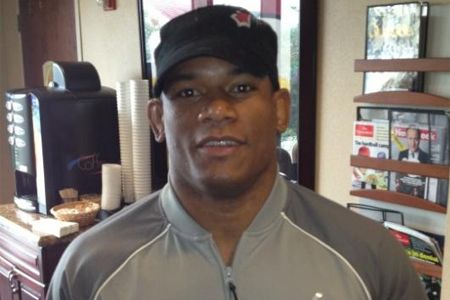 After watching opponent Brian Stann exit “UFC on FOX 4” with a shoulder injury, Hector Lombard (Pictured) requested to make his big league debut against Michael Bisping. Unfortunately for “Lightning,” Bisping is battling Tim Boetsch at UFC 149. Scratch that, “The Count” WAS facing Boetsch. Late Wednesday night, it was announced Bisping is the latest Octagon fighter to be stung by the pesky injury bug. Lombard now replaces the Brit and will fight “The Barbarian” on July 21st. No word on what wound forced Bisping out of the scrap or how long he’ll be riding the pine. Lombard has strung together 24 consecutive wins and has long been considered to be one of the planet’s top 185-pounders not competing in the UFC. He was last seen posting a TKO victory over Trevor Prangley at “Bellator 58” this past November. Boetsch has posted a perfect 3-0 mark since dropping to the 185-pound division. He is fresh off a spectacular comeback victory over former top contender Yushin Okami at UFC 144. Scotiabank Saddledome in Calgary, Alberta, Canada hosts UFC 149. A featherweight title tilt between champion Jose Aldo and Erik Koch headlines the extravaganza.